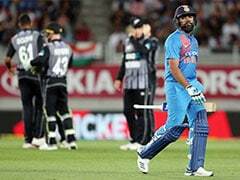 Highlights: India vs New Zealand 4th ODI: India were bowled out for paltry 92 runs. Highlights Between India vs New Zealand 4th ODI, straight from Seddon Park. 11:05 IST: That brings an end to the fourth ODI between India and New Zealand in Hamilton. Thank you for joining us for the live coverage. 10:59 IST: FOUR! New Zealand beat India by eight wickets. Ross Taylor (37*) scored the winning boundary for New Zealand and shared a match-winning 54-run stand with Henry Nicholls (30*). India are 3-1 up in the five-match ODI series. 10:58 IST: SIX! Lovely shot. It bring New Zealand closer to the small target. 10:57 IST: End of the over! Just two runs off it. New Zealand are 81/2 in 14 overs, need 12 runs to win. 10:53 IST: Kuldeep Yadav comes into the attack. 10:52 IST: SIX! Back-to-back sixes to conclude the over. Ross Taylor played this one with even more comfort. New Zealand are 79 for two in 13 overs, eyeing an emphatic win in Hamilton. 10:51 IST: SIX! Ross Taylor lofts it up over the deep mid wicket for a maximum. 10:47 IST: FOUR! Glorious shot. Left-hander Henry Nicholls displays sheer elegance with a cover drive. It gets him a boundary and takes the home team to 63/2 in 11.5 overs. 10:42 IST: FOUR! Ross Taylor flicks a full toss delivery by Yuzvendra Chahal behind square leg for a boundary. It came full on his pads and Taylor played an imposing shot. 10:41 IST: Yuzvendra Chahal comes into the attack. 10:40 IST: End of 10 overs! New Zealand are 51 for two, 42 runs away from the target. Henry Nicholls (19*) and Ross Taylor (6*) keep the hosts in a commanding position. 10:35 IST: 50 up for New Zealand! Ross Taylor takes a quick single to take the hosts to the 50-run mark in 8.4 overs. 10:33 IST: 2 runs. In the air... but there's no fielder at mid off. A risky shot from Ross Taylor. But he gets a double off it. 10:29 IST: SIX! Henry Nicholls flicks it away to the fine leg for a six. He made good use of the swing of the full length delivery by Hardik Pandya. It takes New Zealand to 45 for two in 7.4 overs. 10:27 IST: Hardik Pandya comes into the attack. 10:26 IST: Bhuvneshwar Kumar completes a maiden-wicket seventh over. 10:23 IST: Ross Taylor comes to the crease. 10:21 IST: WICKET! Bhuvneshwar Kumar claims his second wicket, removes Kane Williamson for 11. A soft dismissal of the skipper. Nicked and caught behind comfortably by wicket-keeper Dinesh Karthik. 10:18 IST: FOUR! Pulled again, gets a couple of bounce to sail across the boundary fence. Henry Nicholls plays a pull shot to get quick runs for the team. The hosts are 39 for one, 54 runs away from the target. New Zealand are 39 for two in 6.2 overs, need 54 runs to win. 10:15 IST: FOUR! A textbook shot from Kane Williamson. New Zealand reach 35/1 in 4.5 overs, need 58 runs to seal a consolation win. 10:11 IST: FOUR! Short and too wide from Khaleel Ahmed and well punished by Kane Williamson for a boundary. 10:07 IST: FOUR! Henry Nicholls gets a boundary off the free-hit. He lifts up the full length delivery by Khaleel Ahmed over the extra cover for four. 10:04 IST: FOUR! Henry Nicholls gets off to the mark with a boundary. He loves to play a pull short on a loose delivery like this one. 10:01 IST: Kane Williamson comes to the crease. 09:59 IST: WICKET! After three consecutive boundaries, Martin Guptil loses his wicket to Bhuvneshwar Kumar for 14. New Zealand are 14 for one in 0.4 overs. 09:58 IST: Martin Guptill makes it three in a row. 09:57 IST: FOUR! This time, straight down the ground from Martin Guptill for a boundary. 09:56 IST: SIX! Martin Guptill starts the small chase with a huge six. 09:55 IST: Martin Guptill and Henry Nicholls are out in the middle to start New Zealand's chase of 93 runs. Bhuvneshwar Kumar to open the attack for India. 09:46 IST! WICKET! India bowled out for 92 runs. James Neesham claims the final wicket. Khaleel Ahmed departs for five on debut. 09:42 IST: FOUR! Clever shot from Yuzvendra Chahal. India are 86/9 in 29.4 overs. 09:40 IST: Khaleel Ahmed edged but put down by Ross Taylor. 09:39 IST: Khaleel Ahmed comes to the crease. 09:37 IST: WICKET! Todd Astle strikes to break the crucial stand. Kuldeep Yadav departs for 15 runs. India are 80 for nine in 29.1 overs. 09:35 IST: Yuzvendra Chahal edged but safe. A fuller delivery by Colin de Grandhomme takes a thick edge but the ball goes past the man through the slip cordon. 09:31 IST: Todd Astle comes into the attack. 09:30 IST: FOUR! Beautiful shot. Yuzvendra Chahal pulls the short length deliver over the mid-wicket for a one-bounce boundary. India read 76 for eight in 27 overs. 09:26 IST: End of the over! Matt Henry bowls a maiden over to restrict India to 71 for eight in 26 overs. 09:21 IST: FOUR! That came out of the middle of the bat. Kuldeep Yadav flicks the fuller delivery by Colin de Grandhomme over the mid-wicket for a boundary. 09:19 IST: FOUR! Bonus runs for India. A bouncer from Mat Henry takes a top-edge off Yuzvendra Chahal's willow to cross the fence with one bounce at deep fine leg. 09:13 IST: End of the over! Matt Henry starts with a maiden over. India are still 55 for eight after 22 overs. 09:10 IST: Matt Henry replaces Trent Boult after a highly successful spell. 09:05 IST: Yuzvendra Chahal comes to the crease. 09:03 IST: WICKET! A five-wicket haul for Trent Boult. Fifth in ODI cricket. Hardik Pandya departs for 16. With this wicket, he equalled Richard Hadlee's record of most ODI five-wicket hauls for New Zealand. India are 55 for eight in 19.4 overs. 08:56 IST: FOUR! 50 up for India. Trent Boult bowls a short pitched delivery and Hardik Pandya pulls it on the back foot over the mid-wicket for a boundary. 08:54 IST: FOUR! Hardik Pandya drives it down the ground for four. Consecutive boundaries take India to 48 for seven in 17.2 overs. 08:53 IST: FOUR! Much-needed boundary for India. Hardik Pandya lofts it over the off side but lands it safe to get a boundary. 08:51 IST: Kuldeep Yadav comes to the crease. 08:49 IST: WICKET! Colin de Grandhomme castles Bhuvneshwar Kumar for 1. It is his third wicket and career-best figures in ODIs. India are in deep trouble, at 40 for seven in 16.4 overs. 08:44 IST: Time for drinks! It has been a highly successful session so far for the home team. 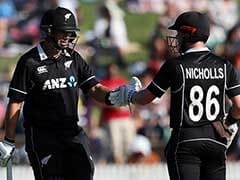 Trent Boult claimed four big wickets, while Colin de Grandhomme chipped in with two scalps as New Zealand restricted India to 39 for six in 15 overs. 08:38 IST: FOUR! Finally a boundary for India after quick wickets. Extra bounce from Colin de Grandhomme allows Hardik Pandya get easy runs for India. He flicks it away to the mid-wicket for a boundary. India are 39/6 in 14.1 overs. 08:36 IST: Bhuvneshwar Kumar comes to the crease. 08:34 IST: WICKET! India lose their review and sixth batsman in Kedar Jadhav. Trent Boult claims four wickets to leave India reeling at 35/6 in 13.1 overs. 08:32 IST: Review time! Kedar Jadhav opts for a review after he was given LBW by the umpire. 08:28 IST: Hardik Pandya comes to the crease. 08:26 IST: WICKET! Caught and bowled. End of Shubman Gill's resistance. Trent Boult claims his third wicket to get the 19-year-old batsman for nine runs. India are still 33 for five in 12 overs. 08:21 IST: Kedar Jadhav comes to bat at number six. 08:19 IST: WICKET! Soft dismissal. Colin de Grandhomme claims his second wicket in the same over, removes Dinesh Karthik for zero. He had scored an unbeaten 38-run knock in the third ODI to power India to victory. 08:17 IST: Dinesh Karthik comes to the crease. 08:16 IST: WICKET! What a catch! Martin Guptill takes a stunning catch as Colin de Grandhomme dismisses Ambati Rayudu for zero. India are 33 for three in 10.2 overs. 08:14 IST: 10 overs gone! India are 32 for two with Shubman Gill (9*) trying to settle early for India. 08:10 IST: Shubman Gill gets a nasty blow on his head from a short pitched delivery by Trent Boult. Indian physio is out in the middle to check if the batsman is fine. 08:06 IST: FOUR! Shubman Gill gets off to the mark with a boundary. He perfectly times the good length ball, flicks it away to the square leg for four. 08:05 IST: Ambati Rayudu comes to bat at number four. 08:04 IST: WICKET! Caught and bowled! Trent Boult claims his second wicket, dismisses Rohit Sharma for seven in his 200th ODI for India. The visitors are 23 for two in eight overs. 07:59 IST: No runs from Shubman Gill in first five balls. Matt Henry concedes just one run. India are 22 for one in seven overs. 07:55 IST: Young batting sensation Shubman Gill comes to the crease. 07:53 IST: WICKET! Trent Boult strikes early to get Shikhar Dhawan. The Indian opener departs for 13. Boult traps Dhawan LBW with a beautiful delivery. Dhawan had a chat with Rohit Sharma but didn't opt for a review. 07:46 IST: Trent Boult bowls an economical over. Just two runs off it. India are 19 without loss in four overs. 07:41 IST: SIX! Maximum for Shikhar Dhawan. He plays an upper cut to loft the shortish ball over the slip cordon for a six. India are 16 without loss in 2.3 overs. 07:39 IST: FOUR! Matt Henry bowls too wide of the off stump and Shikhar Dhawan deflects it for a quick boundary. 07:35 IST: Trent Boult to bowl from the other end. 07:34 IST: End of the over! India are three without loss after the first over. 07:24 IST: "We would have batted first anyway, the motivation is high and it's important to give your best when you wear the India colours," says Rohit Sharma at the toss. 07:18 IST: "Looks like a good surface, hopefully, some dew will come later. The stats suggest it's a chasing ground, we need to take some early wickets," says Kane Williamson after winning the toss. 07:02 IST: TOSS! New Zealand win toss, opt to bowl in Hamilton. India are playing with two changes - Shubman Gill comes in place of Virat Kohli and Khaleel Ahmed replaces Mohammed Shami. 06:55 IST: MS Dhoni also missed the third ODI due to a hamstring injury. India won the match by seven wickets to take an unassailable 3-0 lead in the five-match series. 06:50 IST: Shubman Gill, 19-year-old batsman from Punjab, is set to make his debut as he received his Team India cap from MS Dhoni. 06:45 IST: Rohit Sharma will play his 200th One Day International match for India in Hamilton and lead the team in the absence of Virat Kohli. Kohli has been rested for the remaining two ODIs and three-match T20 International series. 06:40 IST: Hello and welcome to out live coverage of the fourth ODI of the five-match series between India and New Zealand in Hamilton. In case Dhoni is available and the team management avoids tinkering with the combination, he will walk in as Virat Kohli's replacement. Kohli has been rested for the remiander of the tour. However, if the visitors opt for a like-for-like replacement, then Indian fans could get a glimpse of the immensely talented Shubman Gill in the senior team jersey. Billed as one for the future, many experts have found a striking similarity in the 19-year-old Gill's strokes with the ones that Kohli plays effortlessly. "I wasn't even 10 percent of what he (Shubman) is, when I was 19," Kohli had said after India's series win in Mount Maunganui.